This TV has announced its Fall 2012 schedule and changes are being made to its "This Is For Kids" morning block. The block is weekdays from 7-10am and features animated series from the Cookie Jar Toons archive. 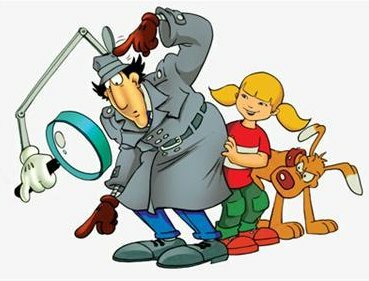 Of note to us is that they will bring back animated comedy Inspector Gadget, voiced by Don Adams, back to its schedule and air it weekdays at 7am beginning Oct. 1. Wowsers! New additions to the line-up include Sabrina, the Animated Series, which will air weekday mornings at 9am. Rounding out the block is Hurricanes, Action Man, Metajets, Prostars, Stargate Infinity, Flight Squad and Horseland. Only the latter is five days a week, at 9:30am, while those other series are either Mon, Wed, Fri or Tues, Thurs. Leaving the schedule will be The Wonderful Wizard of Oz, Tattooed Teenage Alien Fighters from Beverly Hills, Super Duper Sumos and Liberty's Kids. On weekends, animated series include Country Mouse & City Mouse Adventures, Danger Rangers, Emily of New Moon, Mona the Vampire and Madeline. Besides the animated series, there are no other changes, so you can expect weekdays from 4am-7am to remain the same with vintage retro TV series with The Outer Limits, Highway Patrol, Sea Hunt, The Patty Duke Show, and Mister Ed. On Sundays, Bat Masterson remains at 7am, while Stargate SG-1 remains at 9pm & 10pm. The rest of the schedule is filled with movies or E/I programming. This TV is a free over the air digital station that brings you award winning films, box office hits, cult classics, retro TV series and all your favorite Hollywood stars! Whether it's on satellite, your local cable provider, or your over-the-air digital signal, it doesn't get better than This! ABC Family has greenlit three additional pilots to add to its production slate -- Terminales, a one hour drama pilot adapted from a successful Televisa series, and two new sitcom pilots, Phys Ed and Continuing Fred. The three pilots will go into production this fall along with the previously announced drama pilots The Fosters (working title), from executive producer Jennifer Lopez, and Socio, from executive producer Gavin Polone. The two sitcom pilots are in consideration to join the network's successful sitcom hour of Melissa & Joey and Baby Daddy. Here are the details on the sitcom pilots: Phys Ed is a half-hour multi-camera comedy pilot about a high school's star jock who returns to teach at his former alma mater only to find that, even though he's changed, nothing else really has. The pilot is written and-executive produced by David H. Steinberg. It is produced by Prodco, Inc. Continuing Fred is a half-hour multi-camera sitcom pilot about 20-something Winifred "Fred" Harris, a newly-graduated slacker with an overbearing family who surprisingly finds purpose when she begins to teach at a local elementary school. Written by Bill Daly (Mike and Molly), the pilot is also produced by Prodco, Inc.
Stay with us if any of these pilots heads to series. Most likely most will, given ABC Family's track record of picking up pilots.